First Aid for Life specialises in teaching first aid for schools and clubs and empowering young people with the skills to help in an emergency. We routinely work with schools, youth groups, guides, scouts and associated groups to train young people to keep each other safe and to understand how to help if faced with a medical emergency. In addition to our practical courses, we have online first aid training www.onlinefirstaid.com where people can learn vital skills and extend their first aid knowledge on their smart phones and mobile devices. 3g – Rules for, and ways of, keeping safe, including basic road safety, and about people who can help them to stay safe. 3g – School rules about health and safety, basic emergency aid procedures and where to get help. Health and safety: recognising that there are hazards in living things, materials and physical processes. Assessing risks and taking action to reduce risks to themselves and others. 4d – Why wearing appropriate clothing and being hygienic is good for their health and safety. 3h – Knowledge of basic first aid. 3.3a – Organisms, behaviour and health: conception, growth, development, behaviour and health can be affected by diet, drugs and disease. 2.2d – Recognising hazards and making decisions about how to control any risks to themselves and others. 3e – Where and how to obtain health information: how to recognise and follow health and safety procedures; ways of reducing risk and minimising harm in risky situations; how to find sources of emergency help; how to use basic and emergency first aid. 2.2d – Organising and managing the environment they are working in to ensure the health, safety and wellbeing of themselves and others. 5e – Organisms and Health: human health is affected by a range of environmental and inherited factors, by the use and misuse of drugs and by medical treatments. Able to deal with injuries and illnesses associated with sports participation. M4 – deal with casualties suffering from three different injuries and/or illnesses. In order to complete the Level 2 Award in Community Sports Leadership, participants must gain a first aid certificate. Reporting accidents in the appropriate manner. First Aid is also a vital skill for young people undertaking their Duke of Edinburgh Awards, working towards Sports Leadership and coaching qualifications and for babysitting. It is also a life-saving skill to have as young people begin to experiment with alcohol and stretch boundaries – teenagers are definitely safer and more aware of potential risks, once they have joined one of our courses. The courses are practical, engaging and fun and prove extremely popular. I teach in a Gateshead school; Joseph Swan Academy and have a group of 60 students, aged 16 to 18, that want to learn the basics of first aid. Do you offer first aid courses for young adults in education? Could you provide me with any extra information please if so? My son who will be 16 in January would like to learn first aid as part of his DoE training. there might be other kids in his school interested in doing it. could you let me know how big a group would need to be for you to put on a course, how long it would run for and how much it would cost please. Dear Valerie, delighted to help. I will send you a separate email. We have practical and online courses suitable for the Duke of Edinburgh Award. I wouldbe interested in organising a private First Aid course for a group of 12 year old. Could you let me know if this is something you can do and if so what would be the format, content and cost please? Thsnk you. I will send you an email. We would be delighted to run a tailored course for a group of 12 Year olds. Hi, my son is 11 and is interested in learning first aid. Can you please send me details, length of course and size of group needed to run one. Thank you for your message. 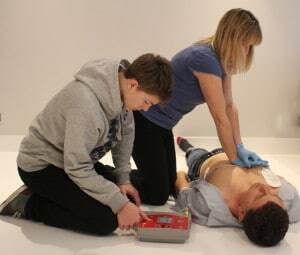 We will send through all the booking information direct to your email address and would love to run a first aid training for your son and his friends. We also have scheduled courses in London and our next teenage course is on WEdnesday 14th February and is suitable for children from 8 upwards. I am interested in working as a first aid instructor with you,I am trained and at present working as a nurse. 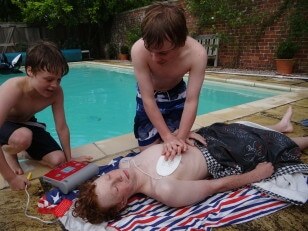 We are looking for first aiders to come and deliver first aid to groups of Year 7 pupils, roughly 180 in groups of 25. I would like to offer a course to a group of 15 students between the ages of 13 and 16. Would you be able to provide this and at what cost? Hi, I’m a Head teacher in Derby and I’m looking to run a course for my year 3 class, over at least 1 term. Could I enquire if this would be possible please? 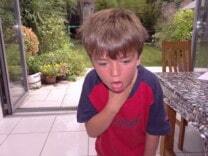 I am interested in First Aid training for the Y5/Y6 children at my school. Could I please have some more information in regards to costs? We are a small Primary school in Leeds looking to train all our children with basic life saving skills do you offer a course and what would the cost be? My colleagues and I are interested in provided First aid training for our Year 6 pupils – please, forward any relevant details on the courses that might be appropriate for this age group.